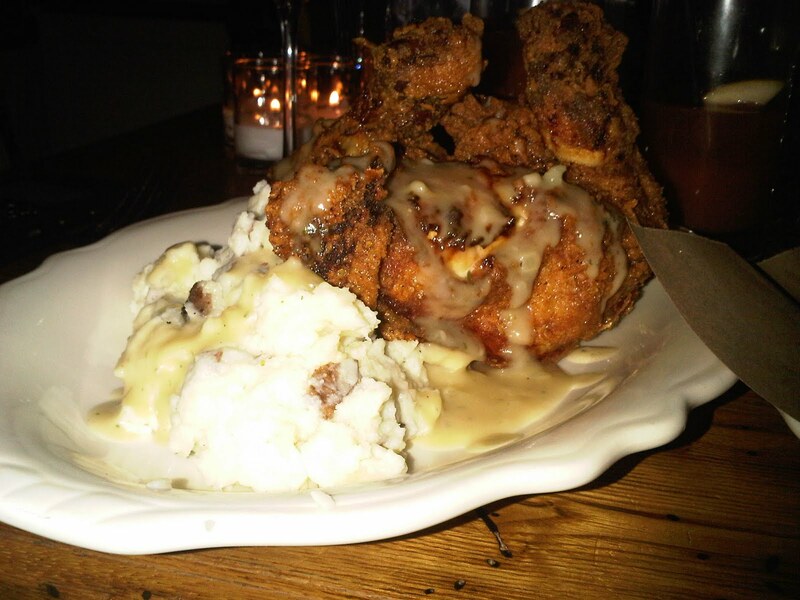 "Peel me off another piece of that fried chicken! ", is all I have to say about this wonderful venue brought to NYC diners by the same owners of Freemans restaurant in the lower east side. 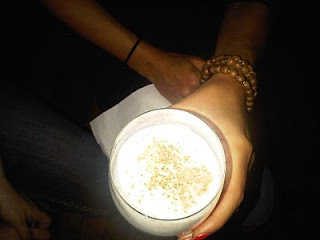 This is such a great place for so many reasons and if you appreciate good old american comfort food like I do, you don't want to miss an opportunity to dine at Peels! We began with the Clam Chowder ($9) a creamy new england style clam chowder served with buttermilk crackers. It was well balanced not being skimpy with the clams that were fresh and diced. 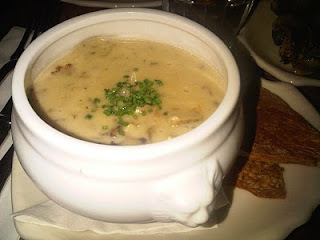 It also had a hint of fresh thyme that really added to the flavor of the chowder. 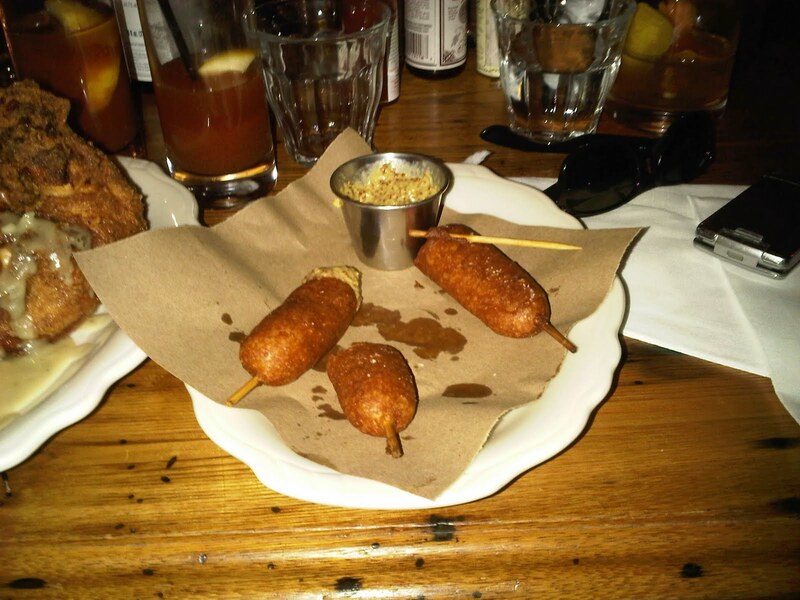 Then for the Andouille Corn Dogs ($9) served with a creole style mustard. 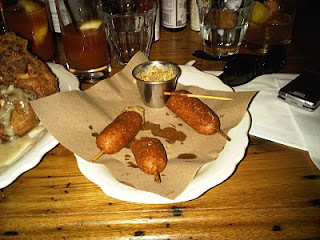 Peels took the good old american corn dog and put their own twist on it substituting the traditional frankfurter with andouille sausage. My dinner guests and I absolutely worshipped this dish!! 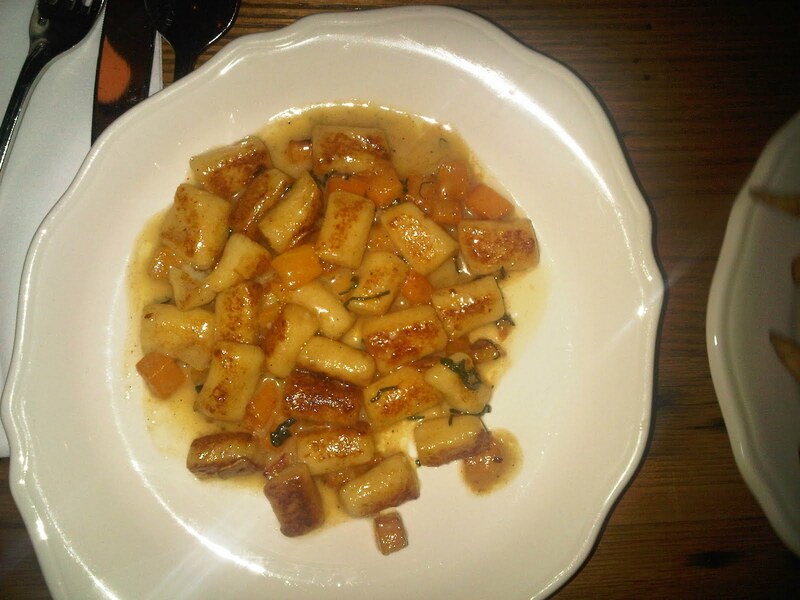 The Potato Dumplings ($9 app/$18 entree) served in a butter sage sauce with roasted squash were very similar to gnocchi in style, just not quite as dense. I liked that the roasted squash brought a touch of sweetness to the dish that was then cut with the butter sage sauce. 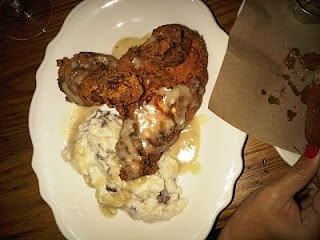 For our entrees we had the Fresh Fried Chicken ($21), which we all attacked like wild beasts on a freshly killed carcass and that is exactly how it is described on the menu, "fresh kill, free-range bird". It was served with red creamer potatoes and a southern style gravy with black pepper. It is american comfort food at it's best and absolutely to die for!!!! The Cheeseburger ($14) held its own as well. It's amazing to me how many places can screw up a burger and that's because producing a delicious tasting burger isn't as easy as one might think. 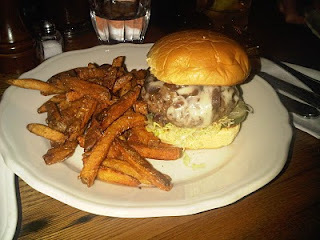 Grass fed beef is used for the Peels burger, which has a very earthy flavor to it, much different then grain fed beef. It is served with cave-aged cheddar, homemade pickles, roasted onions and french fries. Need I say more? 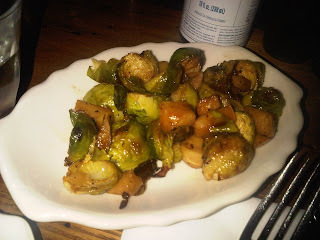 All the entrees came with sides, however, we ordered the Roasted Brussel Sprouts ($6) that were roasted along with diced apples. The sweet flavor of the apples kind of cut the bitter taste that brussel sprouts can sometimes have. I thought that was a very interesting twist. We skipped dessert and I'm sorry we did as I later found out that Peels makes some excellent doughnuts! Sunday is doughnut day and they run a special $2.50 a doughnut until they are sold out. I hear they do interesting flavors such as Sesame sugar and Tasso sugar flavored doughnuts. You don't want to miss the Peels experience! They are open for breakfast, lunch and dinner. It's a great place to sit and cure that post partying hangover at Sunday brunch with friends, or to stop in for a cocktail and people watch as there was a nice amount of good looking hipster types roaming the place. I'm hooked!